sometimes paper and pencil is the best technology for the job, sometimes not. 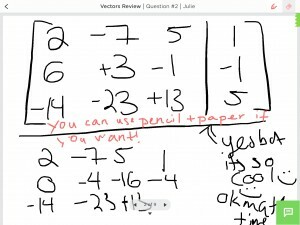 This is a post about how Classkick, an iPad app, has changed my classroom. It is unsponsored, wholly deserved praise for a new tool that you should try if you have iPads in your school. After hearing about Classkick on twitter a few months ago, I had the IT department download it onto our class set of iPads. 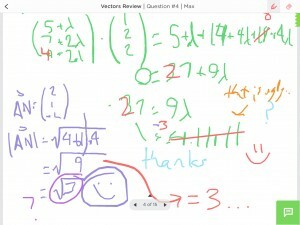 I tried playing with it in a math class of 15 students, where they worked at solving problems in groups and wrote their solutions on the iPad. I could track each group’s progress but I wasn’t really interacting with them through the tool the way shown in the video. It was fun and certainly the novelty factor was engaging, but I didn’t see it becoming a regular feature in that class. 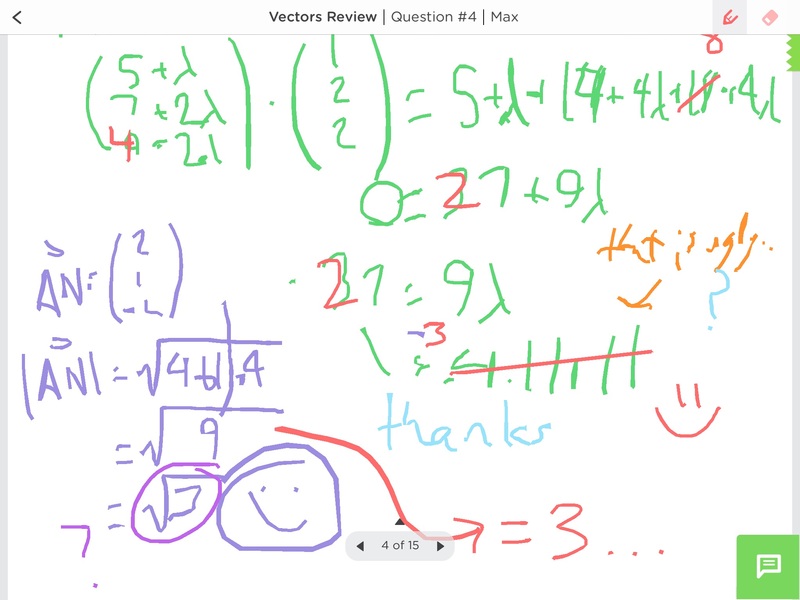 To be honest, the workflow involved in setting up a deck of math problems required too many clicks for me, and the resolution on my images was poor. I set it aside for another later attempt. And then, just a few weeks ago, I had one of those difficult days as a teacher: a sick child at home and a class of advanced math students requiring instruction. Teaching has missed out on much of the workplace flexibility that has infiltrated other professions with the internet age. Teaching children and young people requires a responsible adult to be present in the classroom, and so teachers remain chained to their scheduled work times. This requirement for physical presence has been one of the most difficult for me as a working parent – as it is for many teachers who are parents (and all sorts of other working parents!) In addition, my grade 12 students are in their final year of university preparation and are ambitious in their goals: I want to support them as much as possible. Due to our school schedule and course alignment, our grade 12 advanced mathematics class can’t afford to miss a day of learning. Flipping lessons has greatly reduced the stress on each lesson, and allows me to keep the pace of the course moving along at a good clip all year, regardless of whether I am absent (or the students are absent – they can keep up via video). But the lesson I missed to nurse a sick child a few weeks ago, that lesson was a review class where the students were consolidating their learning – it was about them doing the work, not me teaching them anything. In the past I would have left them to themselves; they are a small group of high-achieving students, self-directed and independent learners. This time, I opted to continue teaching… remotely. The ability to teach remotely added an entirely new dimension of flexibility that has been lacking in this profession. We teachers work pretty hard already, and teaching is an intense job. It’s surprising how exhausting it is, and teachers should probably take all the down-time they can get, right? And yet, every teacher will tell you: it is harder to be absent from school and prepare lessons for a substitute, than it is to be present. It’s why teachers keep teaching while they are sick – it’s actually easier than the alternative. But Classkick has opened up new routes for me to keep students learning when we aren’t all in the classroom together. Before flipping lessons and teaching remotely, every class I missed had to get smashed into another lesson, making the subsequent lessons more stressful. Keeping the pace of my class moving along when I’m not able to be in the classroom is less stressful, even if it means teaching from home. I suspect that this is often true for students too. The school day is busy, incredibly full of listening, learning, absorbing, sitting, thinking, trying, failing, engaging in ideas… and maybe being bored. Students have after-school activities, sports, music, family, friends, and homework. If they can get answers to homework questions while they are working on them, so they are prepared for the next lesson and can use that lesson time for learning new material, won’t that also reduce their stress levels? 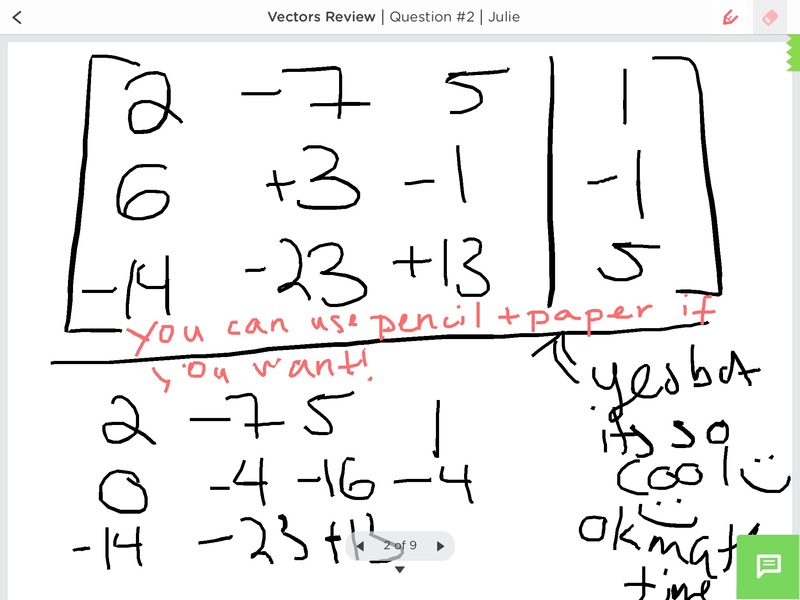 Classkick is the virtual whiteboard I have been looking for – students can write their solutions on there and even get help from their peers (they don’t need me!) Can they use this at home in the evenings, to help each other remotely? Yes. I just have to set up a blank deck “assignment” that they can all access. 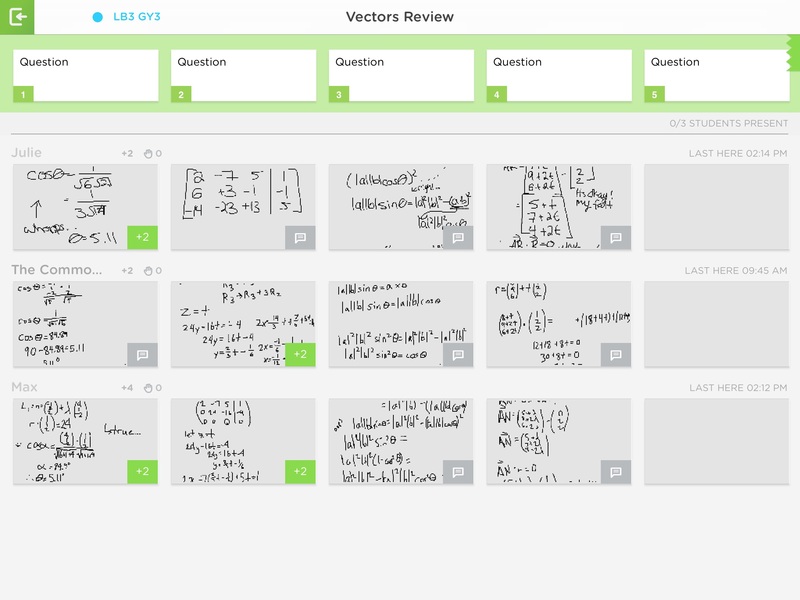 This is my next goal with Classkick: giving students more flexibility in the timing of their learning. Thank you to the team at Classkick (find them on twitter: @getClasskick) for the great tool, and also for responding to me over the Thanksgiving weekend! This entry was posted in Lesson Ideas, Math by Ruth Eichholtz. Bookmark the permalink. This is a great post and what seems like a great tool! We’re moving toward Ipads in the next phase of our tech plan so I’ll definitely be sharing Classkick with the faculty here at LCS. Thanks for such a detailed post. I liked the part about letting students show more and teachers show less – “they don’t even need me” I think sometimes we as teachers can get in the way of learning and it’s about empowering young people to be engaged and connected learners. Thanks for this recommendation. I just seen your review via an email from Dan Meyer and was really interested in how you are using Classkick. I will be recommending some colleagues at my school and group of schools to have a look as well! I’ve also recommended your blog! Really interesting! We’d love to connect with you and get your seasoned opinions on Classkick and what we can do better to provide teacher and students with a place to give and receive help. Would you be available for a quick chat with one of our co-founders about the things you love and hate about Classkick? If so, please email me so we can set something up! Want to know when I post something new? Sign up! Why is Cohort21 so Effective? Lara on Why is Cohort21 so Effective? Justin Medved on Why is Cohort21 so Effective? Nichola Bendle on Why is Cohort21 so Effective? Shelley Thomas on Why is Cohort21 so Effective? Copyright © 2019 deviating from the mean All Rights Reserved.